Strong SQL Server security has become a more important part of a robust defense. But what are your options for security auditing? features into SQL Server. These SQL Server auditing features not only help DBAs generate audit trails of schema changes and security-related events, but also allow companies to meet various regulatory compliance requirements such as the Gramm-Leach-Bliley Act (GLBA), the European Union Data Protection Directive (EUDPD), the Health Insurance Portability and Accountability Act (HIPAA), the Payment Card Industry Data Security Standard (PCI DSS), and the Sarbanes-Oxley Act (SOX). In addition to helping organizations meet regulatory compliance requirements, these auditing features also enhance their data and database infrastructure security. SQL Server login auditing is a legacy form of auditing that can be used to record failed and successful login attempts on the server. Login auditing writes to the error log. Recording connection attempts is useful to be able to get answers to questions about who is attempting to connect to the database, whether an attack is currently taking place or whether an attempted attack was successful. Right-click SQL Server in Object Explorer; choose Properties. Set the login auditing property. Choose from: none, failed logins only, successful logins only or both failed and successful logins. Click OK and restart SQL Server. Right-click the SQL Server in Object Explorer and choose Properties. Click Security and then check Enable C2 audit tracing. Alternatively you can use sp_configure to enable C2 audit tracing. Please note that while the C2 security standard is still available in SQL Server 2012, it is being replaced by Common Compliance Criteria and will probably be removed from future versions of SQL Server. SQL Profiler Trace security audit events can be used to track any object access and login configuration and security events. Results are stored in trace files or database table. For more information about how to create SQL Trace, visit Create a Trace (SQL Server Profiler). DDL triggers can be used to log information about DDL and SQL Server security-related events to a table. Logging DDL events provides you with an audit trail and potential warning of an elevation of privilege attack, a user who's been assigned too many permissions or a user who's misusing their permissions. You can specify the scope as Server or Database when you specify the trigger. Server scope triggers fire (execute) in response to server object events (objects such as logins). Database scope triggers fire in response to database object events, such as schemas, tables and views. The EventData function provides detailed information about the DDL or security-related event that caused the DDL trigger to fire. The EventData function returns a value of type xml. The schema differs depending on the type of event. Event Notifications were introduced in SQL Server 2005 and offer the ability to collect a very specific subset of SQL Trace, DDL and security-related events through a Service Broker and queue. Event Notification allows automated processing of the events asynchronously (outside the scope of a transaction) through Service Broker. Event notifications can offer a programming alternative to DDL triggers and SQL Trace. For more information, see Understanding Event Notifications vs. Triggers. Now test the Event Notification setup and then examine the output of the SecurityLog table. We can also use SQL Server audit to track the security-related event. SQL Server audit is a SQL Server Enterprise Edition feature, which has been available since SQL Server 2008. 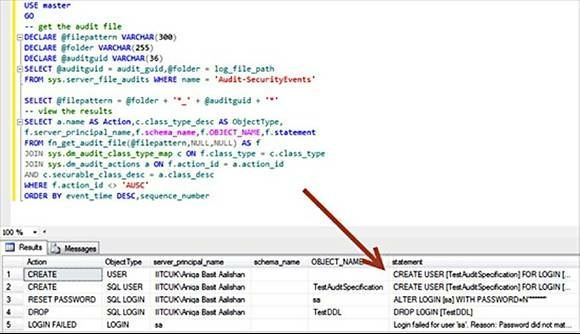 SQL Server audit uses extended events to help perform an audit. Hi! Please, do you know to say me if exists a solution for SQL 2000 equals EventData() from SQL 2005?